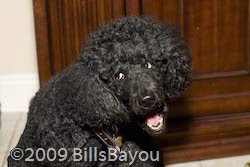 Bill's Bayou: How's that work again? I just received one of those personality tests in my email. It advised me to keep an open mind by using the old standard "Minds are like parachutes. They only work when they are open." The personality test took many things for granted and got everything wrong. So much for opening my mind. Now I want to try slapping the side of my head to see if I can get out all the crap that fell into my mind when it was open. I don't think that parachutes only work when they open. They certainly have a function when they're open, but they also have a function when they're closed. Try exiting a plane with an open parachute. No. Not really. It'll kill you. Your reserve 'chute will kill you too if you open it when your primary is functioning perfectly. I'm all for opening your mind to new things. However, once you realize what someone is trying to put in there, you may want to quickly close it up. I need to go attenuate my tin-foil hat.